THE DEFENCES FORCES carried out a controlled explosion after an unstable chemical was discovered at a school in Glasnevin, Dublin this morning. 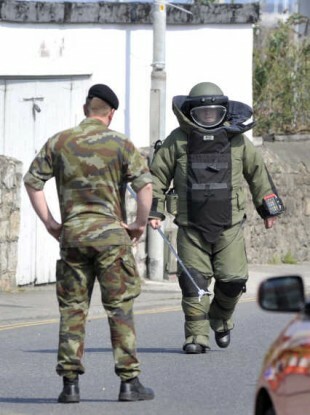 An Army Bomb Disposal team was deployed to Coláiste Chaitríona on Mobhi Road in Glasnevin this morning following a the discovery of the unstable chemical – Dinitrophenylhydrazine – during a routine audit of chemicals in the lab. The team arrived on the scene at 11am and removed the chemical from the building. A controlled explosion was carried out in order to make the chemical safe and the scene itself was declared safe at 12.20pm, according to the Defence Forces. Dinitrophenylhydrazine is a chemical reagent which is found in laboratories. It is relatively sensitive to shock, heat and friction and can become unstable over time if it crystallises. Today’s call out was the 27th this year for the Army Bomb Disposal team and the first dealing with a hazardous material such as Dinitrophenylhydrazine. Email “Controlled explosion carried out at Dublin school”. Feedback on “Controlled explosion carried out at Dublin school”.